The Chew: Turkey Brine Dries Skin? In the battle of the brine, Michael Symon decided to make an Italian turkey that he was not going to brine. He explained brining is bad for the turkey because it acts like a balloon. The balloon looks nice when it is blown up but as the air is sucked out, how the brine is sucked out of the turkey, the balloon becomes wrinkly, like the skin on the brined turkey. Get the recipe for the Italian turkey below. Each serving will cost about $3.74 and according to the audience this turkey is better than Mario Batali’s Greek turkey. I guess you will have to decide for yourself what you like better. The Chew watch as Michael Symon prepared an Italian Turkey recipe without using a brine, which he explained can dry out the skin during cooking. Michael Symon said he sometimes like to keep the turkey unwrapped in the refrigerator. 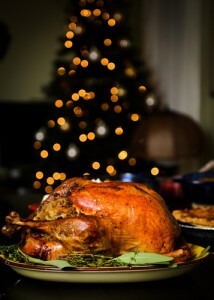 Remove the turkey from the refrigerator 1 to 2 hours prior to roasting to bring to room temperature. Preheat the oven to 425 degrees F.
Put the pancetta in the bowl of a food processor and pulse until it forms a paste. Transfer to a bowl and mix in by hand garlic, citrus zest, parsley, rosemary, red pepper flakes, and capers until thoroughly blended. By blending the pancetta and not using the strips you would normally see pancetta look like, the pancetta will be able to roast with the turkey, instead of just getting crispy. Carefully put your hands underneath the turkey skin and separate the skin from the breast. Put the pancetta mixture in a piping bag and pipe between the skin and the turkey breast, pressing to even it out. In the turkey’s neck cavity, place a few cloves of the garlic, a few sprigs of oregano, a few sprigs of thyme, and a quarter of the lemon. Wrap the neck skin over and around the cavity to enclose the seasoning ingredients. In the body cavity, place half of the remaining garlic, half of the onion, half of the fennel, the fennel fronds, 2 lemon quarters, and half of the remaining oregano and thyme. Meanwhile, in a small sauce pot, combine all the basting ingredients and bring to a simmer. Let cook for about 10 minutes. Remove from the heat and allow to cool slightly. When cool enough to handle, soak a double layer of cheesecloth big enough to cover the bird in the basting mixture and drape over the turkey. Pour the remaining contents of the pan over the bird, pushing the pieces of vegetable and herbs into the bottom of the roasting pan. Add the neck and gizzards to the bottom of the roasting pan. Symon said he uses the cheesecloth so he does not have to baste the turkey. This allows the temperature inside the oven to stay at a constant temperature without someone opening and closing the oven every so often to baste the turkey. Place the turkey in the oven and roast for 45 minutes. Turn the oven temperature down to 375 degrees F, and continue to roast for another 15 to 20 minutes per pound (removing the cheesecloth for the final 10 minutes to brown, if needed), or until an instant-read thermometer inserted into the center of a thigh registers 160 degrees F (about 3 hours). Remove the turkey from the oven and allow to rest for 20 minutes before carving. Return the roasting pan to the stove and place over medium high heat. Add the sausage and fennel and cook until browned, about 7 minutes. Add the flour to the sausage mixture and stir in and cook for 2-3 minutes longer. Deglaze with the wine and reduce by half. Then add in the turkey stock and bring to a simmer. Cook for a few minutes until the gravy is thickened. Whisk in the butter and adjust seasoning. Serve the gravy with the turkey.